Ever make a change to your app, run it, and have it die on a simple syntax error? Wouldn’t it be great to catch it while still in the Code Window? 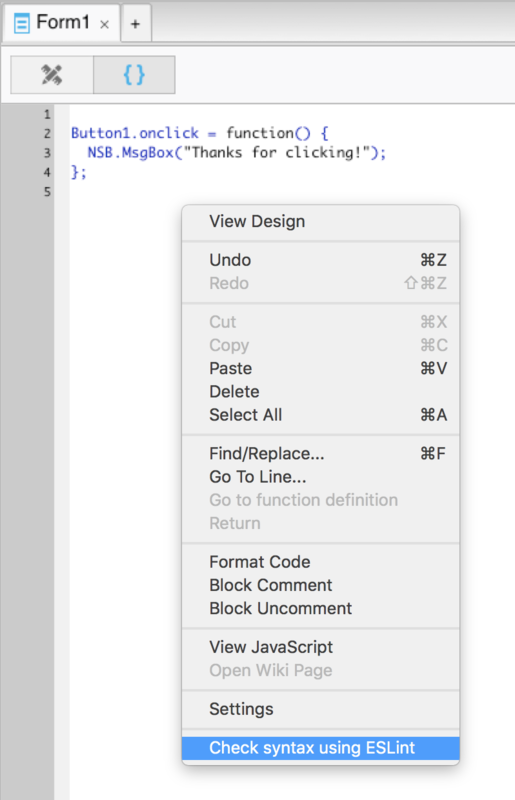 Here’s how to use it: Right click in the Code Window, click on Check syntax using Eslint. A window will pop up with a list of errors and warnings. Checking is done using the well known eslint utility. Eslint uses a set of customizable rules. For rules, we use the widely accepted AirBnB Style Guide. If you have a team of developers working on a project, it will also help enforce a consistent programming style for all members of the team: they will be able to read and fix each other’s code much more easily. Could Minecraft be done in App Studio? The original code used here was written by Notch. It has been tweaked a bit for better performance. The speed at which it runs depends on the hardware, of course: it’s good on the desktop and on devices like the iPhone 5.